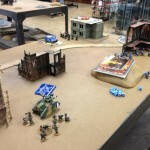 I finally got around to playing my first game of 40k 6th edition yesterday! 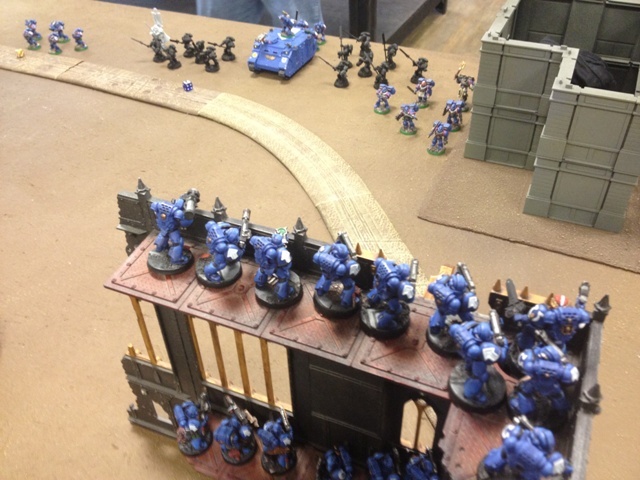 Actually, this was the first 40k I’ve played since I was at Adepticon back in April, so it has been quite a while. 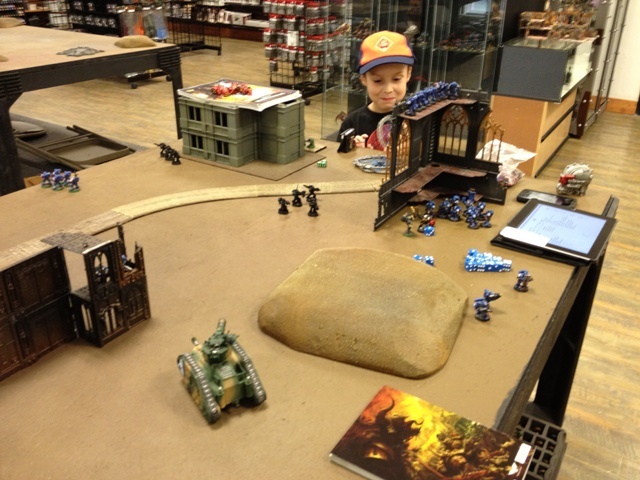 I met up with a couple of fellow Freebootas, JD_Jess, Brother Marius and his son at Dropzone Games in Glen Burnie, MD to play, and we had a great time! We ultimately played 1000 points on 1000 points, in order to keep from confusing ourselves too much while playing. Since we were playing two on two, that meant we were down to just 500 points a piece. 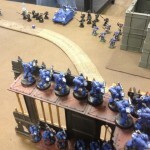 Brother Marius’s Ultramarines were teamed up with my Imperial Guard against his son’s Grey Knights and JD’s Ultramarines. 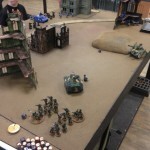 Given that I only had 500 points to work with, my list consisted off a company command squad in a Chimera, two squads of Veterans, and a Leman Russ, while Marius took two tactical squads and a Chaplain. 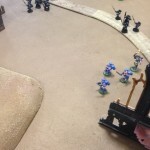 On the other side was Castellan Crowe and two Purifer Squads, along with a tactical squad with a Rhino, a 5-man assault squad led by a Chaplain, and 5 Scouts led by Tellion. 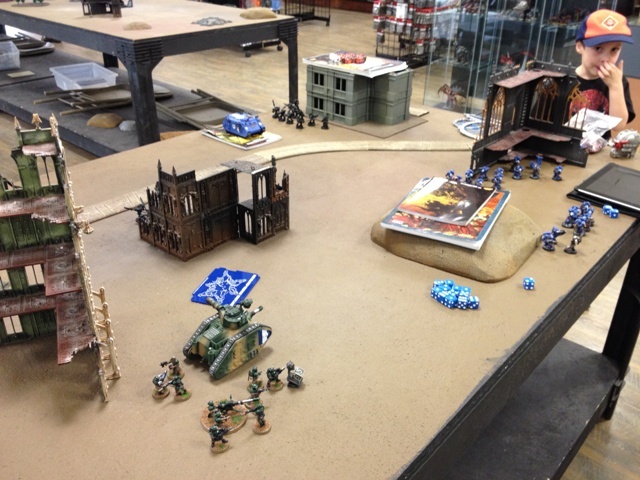 At the start of the game, we rolled for the Crusade mission (D3+2 objectives) and Dawn of War deployment. Once the 4 0bjectives were placed, we were off to the races! 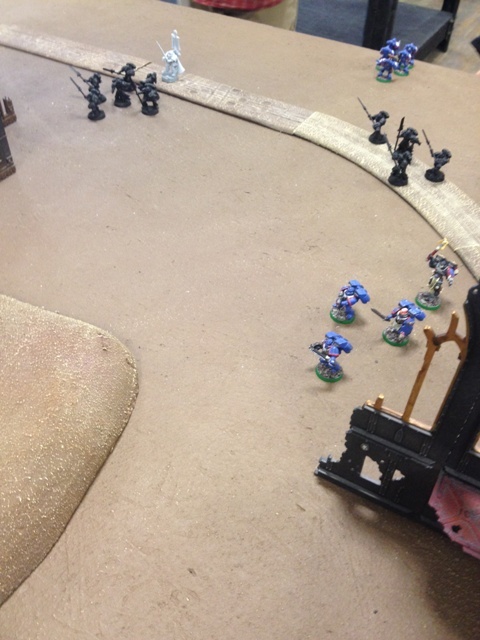 The first couple of turns involved both sides jockying for position. 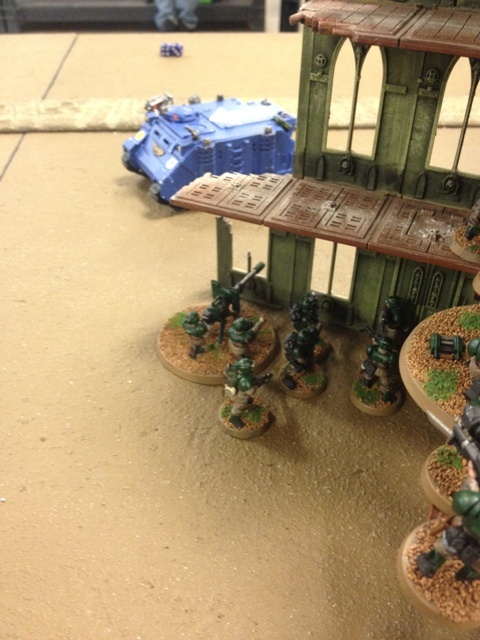 Tellion and his scouts managed to pick apart my vet squads pretty effectively, causing one to run of the table (after the Sarge took one between the eyes!). By Turn 3, JD had moved his Rhino onto an objective, but my remaining Vet squad managed to blow up the vehicle with a well-placed Melta shot. This set up a telling blow for the Russ. 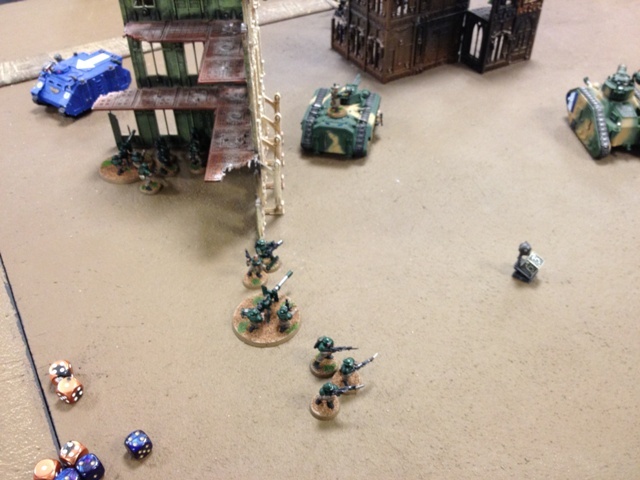 which managed to kill 4 Marines with its Battle Cannon. 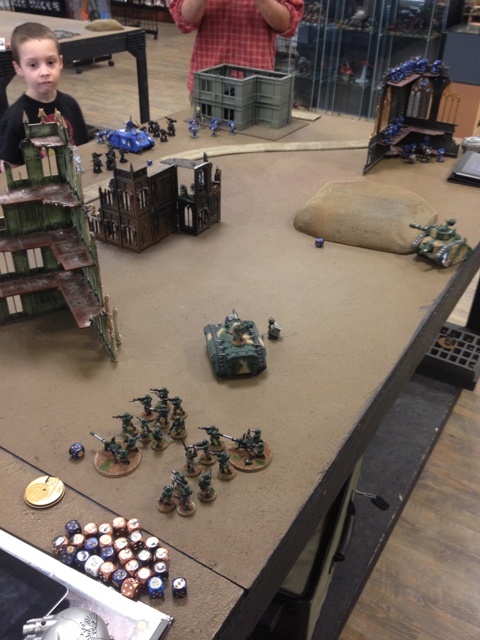 On the other side of the table, Brother Marius’s Marines were fighting a desperate hand-to-hand battle against both his son’s Purifiers and JD’s Assault Marines.The centerpiece of this action was the challenge that was fought out between the two Chaplains! That ended only in death, when both took the other’s last wound in the same round of combat. By Turn 4, Brother Marius had solid hold on one objective, while his son and JD had one a piece. 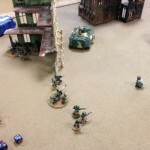 At this point, I started rushing my remaining Vet squad towards the objective near my deployment area, since I had left it uncovered. 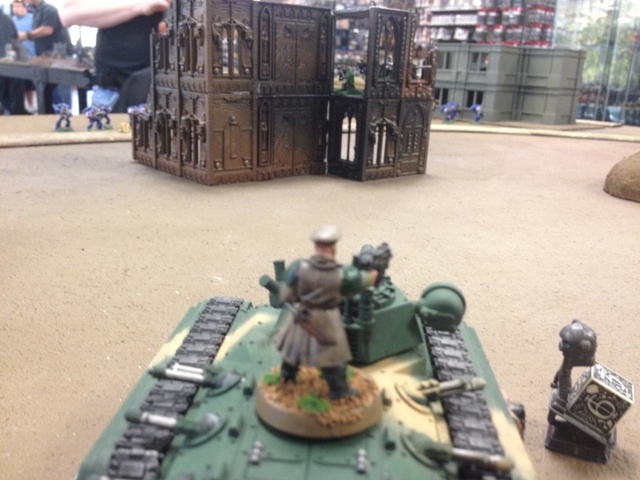 My Leman Russ and Chimera continued to take shots of opportunity, managing to finish off the Scouts in the middle of the table. 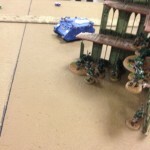 However, on Turn 5 my Chimera was destroyed by a shot from a Purifer’s psycannon, forcing my command squad to hoof it the rest of the game. 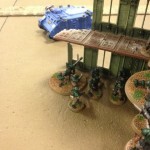 The Leman Russ managed to return the favor, though, by killing 3 Grey Knights with its battle cannon. At the end of Turn 5, JD rolled to see if the game would continue, but he only rolled a 2. Game over! 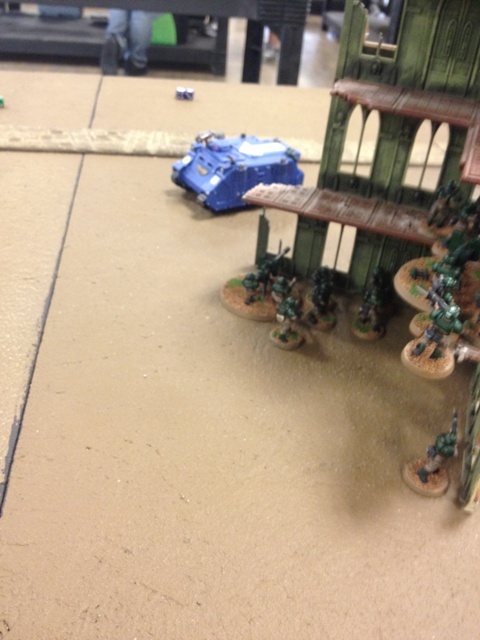 We wound up tying, two objectives to each side. 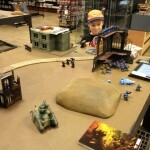 Overall, I felt this was a good introduction to 6th Edition. It was a very interesting experience; the basics are pretty much the same from what I remember in 5th Ed, but so many very important details are different. 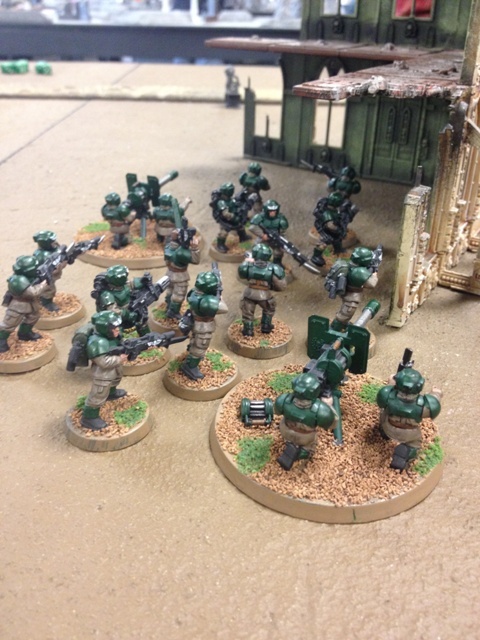 The biggest difference that I saw in this game was the importance of unit placement; with the changes to how cover works and the fact that casualties are removed from the models closest to the firing unit means that I can’t just move my squads all willy-nilly anymore. 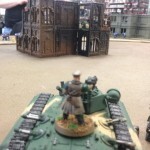 I’ve also heard that vehicles are more vulnerable overall in this new edition, though that didn’t come into play as there wasn’t a lot of anti-tank on the other side. Worse, what anti-tank that JD had didn’t do a lot (they don’t call them MISS-le launchers for nothing!). Overall, this new edition looks to be a lot of fun; it definitely seems like it is a worthy successor to 5th. I’m definitely looking forward to my next game! 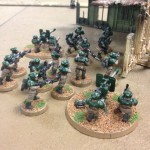 This entry was posted in Miniature Wargaming, Warhammer 40k and tagged 40k, 6th Ed, Freebootas. Bookmark the permalink.